Panorado JS 2.5 Free on private websites! What is unique about this viewer? What kind of images can be displayed? Which system environment is required? You want to check out the viewer? You want a panorama on your private website? You are considering a commercial application? Panorado JS enables you to design websites and web applications with interactive panoramic pictures or other kinds of large pictures. A picture tells more than a thousand words - this also applies to websites. And a panoramic picture tells more than an "ordinary" picture. 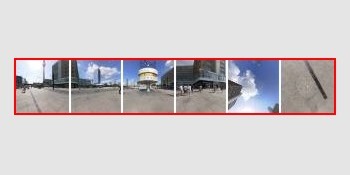 Panoramic pictures can present locations in 3 dimensions - and thus add attraction to your website. The Panorado JS viewer makes a large image visible within a smaller window. You can use your mouse, your fingers or your keyboard to move the visible portion. For zooming in and out, use the mouse wheel, pinch zooming (on touchscreens) or the keyboard. The viewer has a very appealing, smooth appearance, using soft start, soft pan, soft zoom, and soft fading effects. The viewer supports touch control and device orientation control on tablets and smartphones. Source images can be in JPEG, PNG, or GIF format. Control buttons for the most important functions can be overlaid automatically. Alternatively, you can create customized controls outside the viewer using HTML elements. 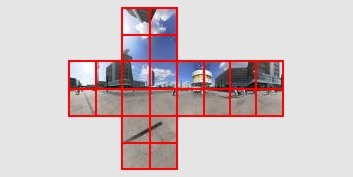 Optional: A compass scale on the lower edge of the image. 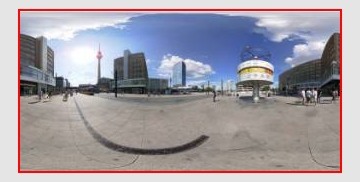 spherical - spherical rendering of panoramic images. The viewer supports hotspots. Hotspots are represented by small symbols which are optionally displayed above the image, providing a textual description when the mouse is above it, and linking to another page when clicked. 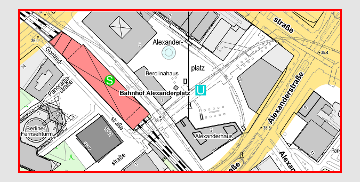 The viewer supports overlays (new in version 2.4). 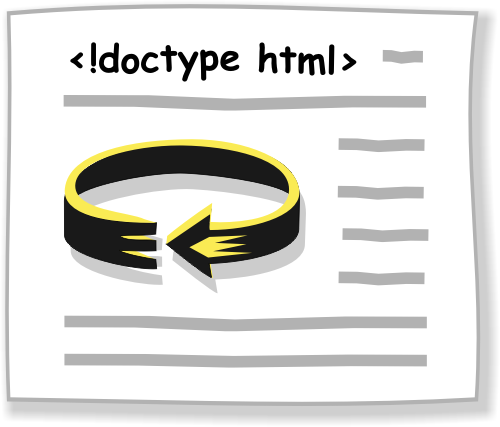 Overlays are similar to hotspots, but allow to define complex HTML elements like <div> which pop up when the overlay symbol is clicked. User interaction is optimized for touch input. The viewer is suited for smartphone/VR glasses combinations (new in version 2.5). See the Tech page for details. Maybe you have some ideas of your own? Have a look at our little Panorama Gallery! Wassersportgemeinschaft am Großen Fenster Berlin e. V.
You certainly need a web browser for displaying HTML pages. Panorado JS requires some HTML5 features which are supported by the current browsers. But absolutely no plugins or add-ons: No Flash, no Java, no Silverlight! Thus, it runs on all popular browsers and on all popular platforms! We regularly perform compatibility tests on 13 different OS/browser configurations. Since HTML5 features are relatively new, canvas and touch implementations differ between browsers. Generally, browsers on Windows 7+ and Android 5+ platforms are quite stable and fast. Most browsers support hardware graphics with WebGL. Panorado JS runs also without WebGL, although remarkably slower. There are still some differences in touch and device orientation handling on tablet and smartphone devices. But quality and performance have significantly improved, and We expect further development in the near future. Take pictures. You can use an ordinary digital camera, if you take care of some details. Click here for more about it. Assemble single pictures to form a panoramic picture ("Stitching"). There is special stitching software; see the details in the background article. You'll find short descriptions of stitching tools and links to manufacturers on the Links page. Write and test the HTML frame. On the Tech page, you'll find two HTML code examples from which you can copy-and-paste to your own HTML page. With some HTML basics in mind, modify and extend the code according to your needs. Copy the HTML document, the image file(s), and the Panorado JS script to your web server, test again. That's it! The current build version is 2.5.1.15. The use of this viewer is free on private (non-profit) websites! The only "limitation" is a little Panorado logo displayed in the image's bottom-right corner. Using the Panorado JS script on commercial (non-private) websites or publications requires a license agreement as soon as the pages containing the viewer are published. This applies for example to corporations, shops, advertising, enterprises, organisations, schools, universities. Viewers with registered license keys don't display a Panorado logo. You have some special requirements? Questions? 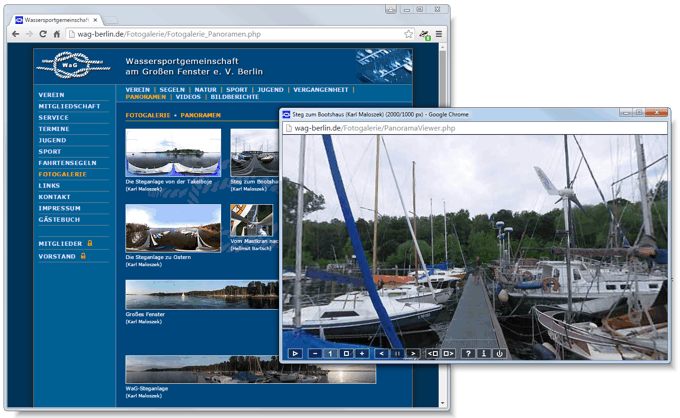 You are planning to use a panorama viewer within a complex web server application? You don't like to do the programming yourself? You need development or customization support? You are interested in a special agreement for a non-profit organisation?